Good morning and happy Saturday! 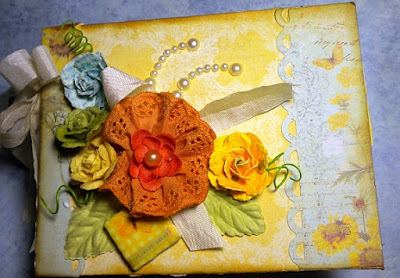 Today I am sharing with you the newest mini album I made featuring the gorgeous new Prima Marketing "Sun Kiss" Collection. The colors and textures are all so yummy! Paper Patch Crafts carries this and more of the new collections now. Please go check it out and see all the cheery new products available! All of the papers, flowers and mini tiles are coordinating. There are many other elements available. 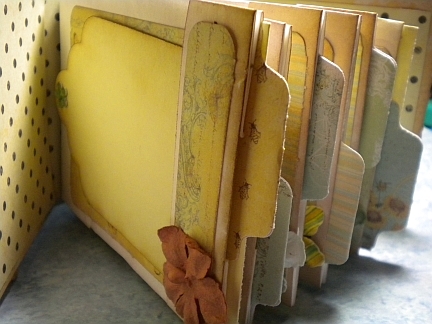 This mini-book design idea was created by Laura from Following the Paper Trail. She has so many ideas for mini albums that I always use her for the source of my inspiration. The bones of the album was created with mini white paper sacks. There are multiple tags and photo mats throughout the album all sandwiched between a sturdy chipboard cover. I hope you enjoyed looking at this fun little album. 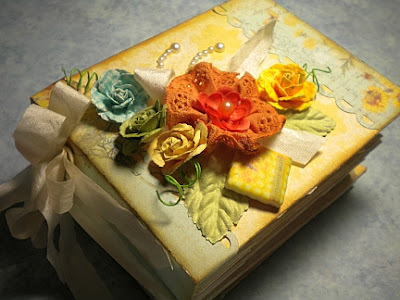 I will have more items to share soon featuring more new products from Paper Patch Crafts from Prima Marketing as well as Webster's Pages!